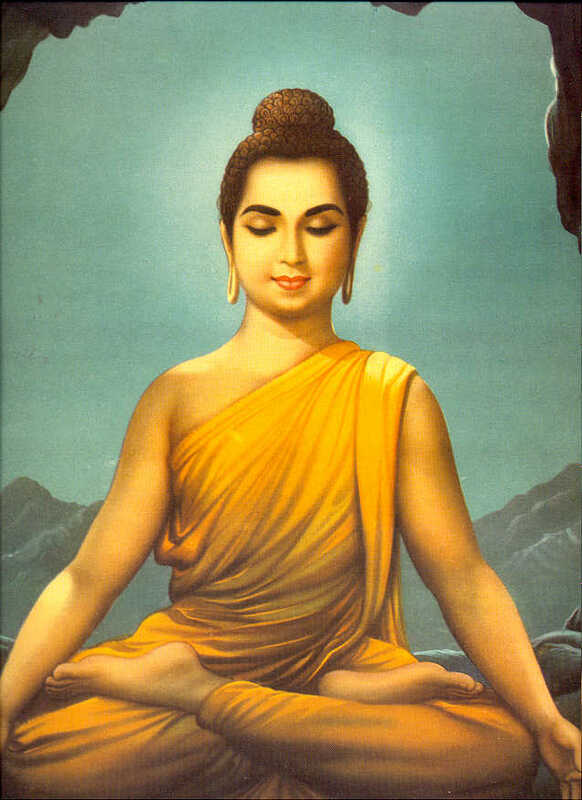 Before descending to Earth in 563 B.C., Buddha Shakyamuni was born in the Tushita Heaven as Devaputra with great clear mind and profound recollection. Seated on the lion throne, he gave teachings to all the gods. At this time, he heard the celestial sound of the cymbals and the songs of the Buddhas of the three times perfectly invoked, addressing him thus: "In samsara, burning with the fire of emotions, you, great warrior, pervade the clouds. The falling rain of your ambrosia pacifies the afflicting emotions of those who are not gods." Hearing these words, he looked for the five sights - the continent called Jambudvipa; the six cities such as Champaka; the Shakya clan which for seven generations, has not declined through intermarriage; a mother named Mahamaya, who was free from the 32 negative qualities; and a time of the five increasing degenerations in which people suffer greatly and become objects of compassion, for they are difficult to tame, hold wrong views, have a declining life span, are defiled by the five mental poisons, and gain wealth through impure means. Seeing these things, he said to the gods: "I will blow the conch shell of impermanence, beat the gong of emptiness, and roar with the sound of selflessness." He then empowered Maitreya to take his place on the throne, and declared three times to the six realms of the gods that he was descending to this world. 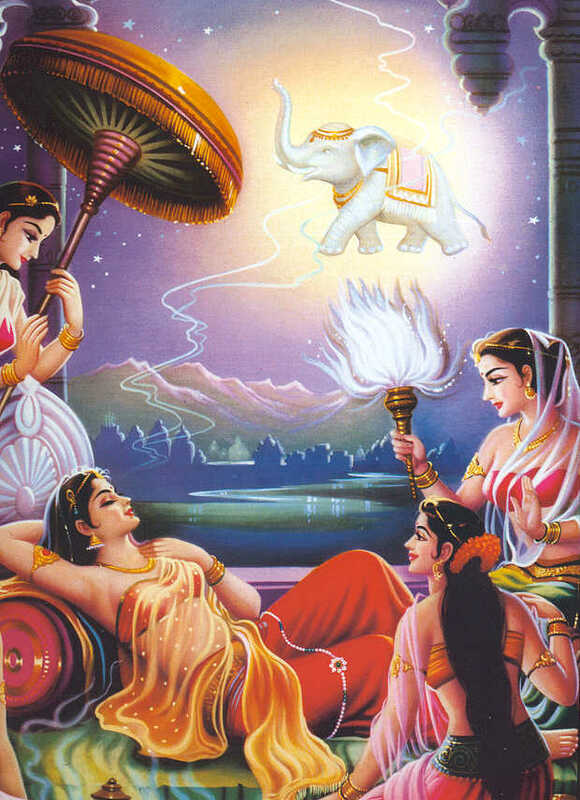 Then he manifested as the precious elephant having an immense, though glorious and gentle, body with six trunks. He was adorned with the golden nets and a beauteous red hat, and gave forth a pleasant odor because of the medical herbs he ate. 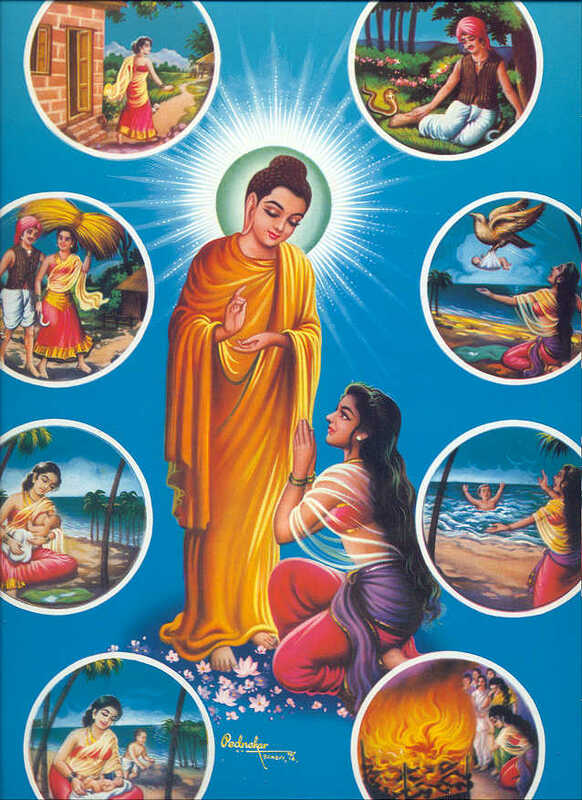 In the middle of the fifteenth day of the second month at the time of the full moon, when Mahamaya was in retreat, the Lord Buddha entered her womb through the right side. Mahamaya then dreamed that a mountain had become her pillow, that the sun was rising within her body, and that she was giving teachings to many sentient beings. She felt light and at ease. In the months to come, she had many other auspicious dreams, and experienced bliss and freedom from afflicting emotions. After ten months, the moment for giving birth. Mahamaya was passing by the Lumbini Garden when, quick as a flesh of lightening, she grasped a branch of the laksha tree with her right hand. The child emerged from her right side, and Brahma and Indra descended to Earth to make offerings, wrapping him in a pure silk cloth. After the gods and nagas bathed him, the child took seven steps in each of the four directions. 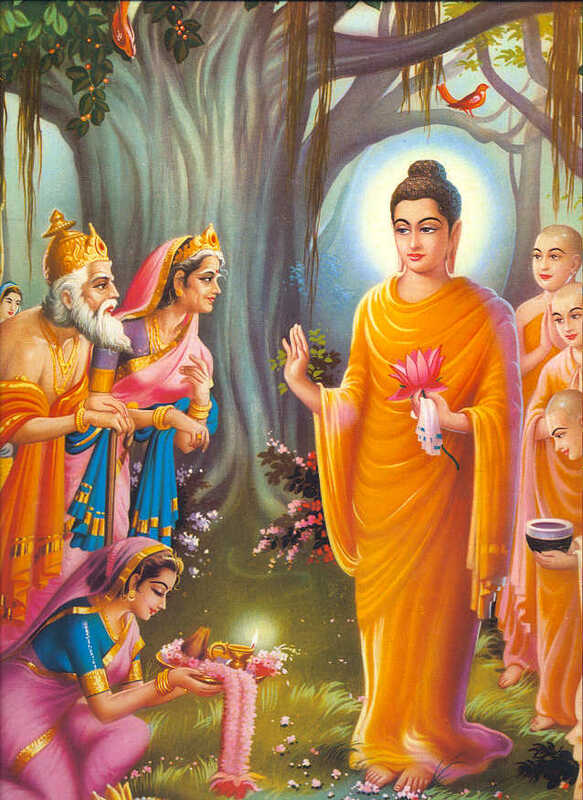 He became known as Siddhartha (the fulfiller of wishes) because he revealed many tresures at that time and fulfilled the wishes of his father. Prince Siddhartha was tenderly pampered. As his mother passed away seven days after his birth, the queen's sister brought up the prince with great affection and tenderness. He was surrounded by all kinds of luxuaries. Though still a child and attended in this fashion by the various kinds of sensory pleasure suitable to his age, yet in gravity, purity, thoughtfulness and dignity he was unlike a child. He received an all-round education. Being intelligent and eager to learn, the Prince became very good at studies and military skills. 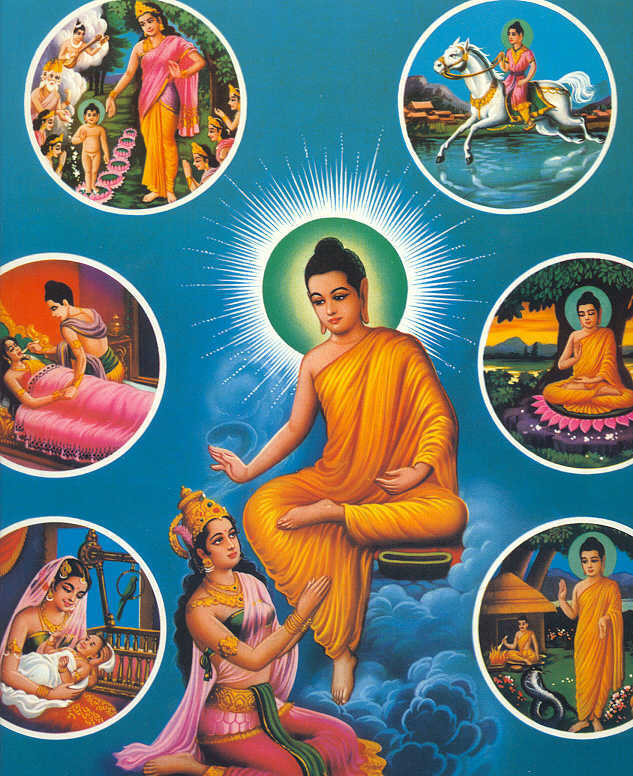 All the Brahmins and astrologers prophesied that if the child renounced the kingdom, he would become a Buddha; otherwise, he would become a universal monarch. One day a rishi called Krishna, along with his nephew, came to the kingdom for the Himalayas. 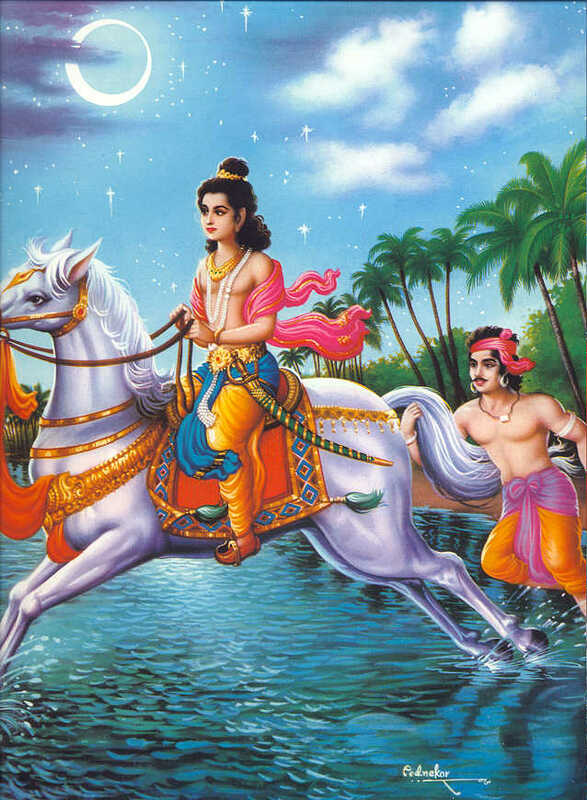 King Suddhodana asked: "Why have you come here?" and the rishi replied: "Great king, I have come to see your son - the sage and liberator of sentient beings. I have to come and see. What kind of prediction have others made about him?" King Suddhodana replied: "He will become a wheel-turner king. The treasure of the teaching contains all the virtues. He will achieve Buddhahood, becoming victorious over all the faults. He will work for the welfare and happiness of mankind." Festival with his father, King Suddhodana. Adorned with the ornaments, he became expert in astrology and literature. When he departed the city, he meditated in samadhi. 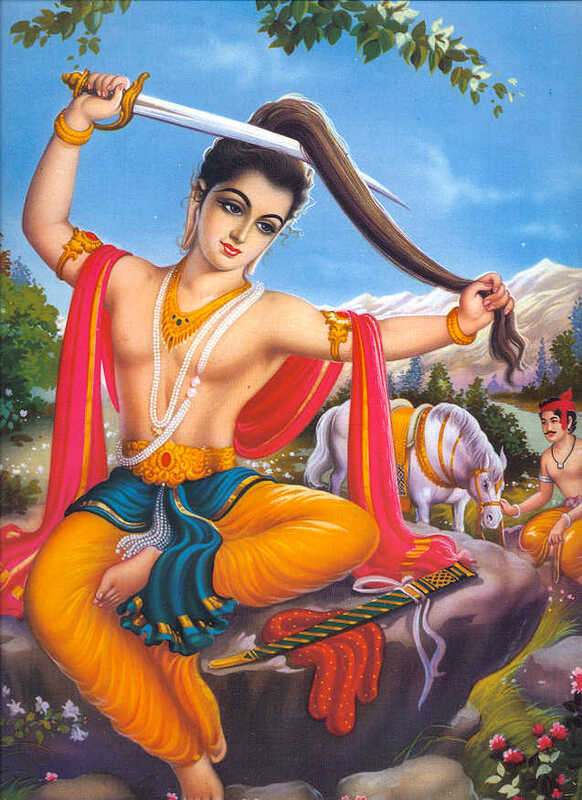 Under the shade of the jambu tree, he was praised by the six sons of the gods. One day, the Prince saw a farmer in worn-out clothes, ploughing the field and whipping an ox. He came to understand the difficult life of living beings. He also saw a bird pecking at an earthworm and an eagle swooping down on the bird. He came to understand that living beings kill one another and only the strongest can survive. 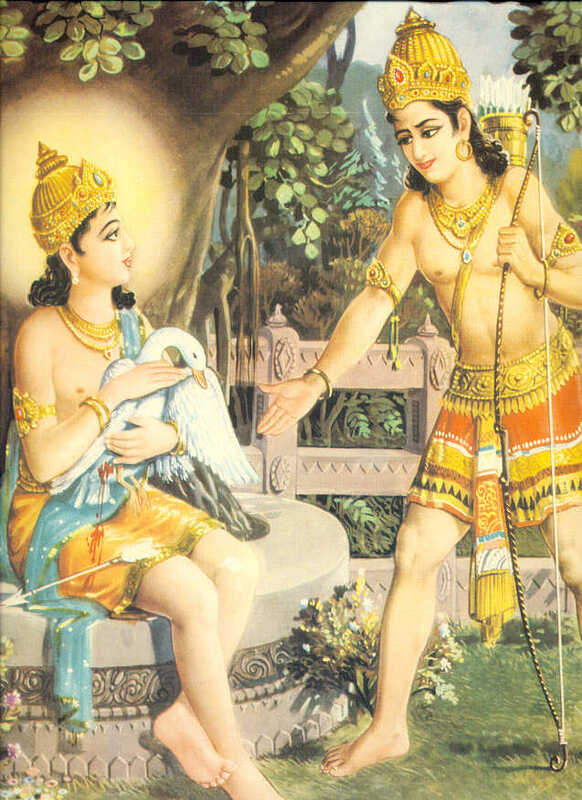 His compassion was shown at his young age, when a crane was shot by Devadatta, he took it in his arms, nourished it, saving it. In his 19th year, he was married to his own cousin Yasodhara, daughter of Suddhodana. He passed hsi youth amid luxury and splendor, in three mansions appropriate to the three seasons, surrounded by forth thousand nautch-girls, like a very god surrounded by troops of celestial nymphs. birth, old age, illness and death. In his 29th year, the prince asked Bodhisattva's attendant Dunpa drove his chariot in the eastern, southern and western directions where he saw aging, sickness and death. Seeing such suffering, he was greatly moved and said: What is the use of youth which is ultimately destroyed by age? What is the benefit of health which will only end with illness? What is the good of wisdom in life if this life lasts not forever? Aging, sickness and death follow each other inevitably. The prince asked the charioteer, "Good charioteer, who is this man with white hair supporting himself on the staff in his hand, with his eyes veiled by the brows and limbs relaxed and bent?" He replied, "Old age it is called, that which has broken him down, the murderer of beauty, the ruin of vigor, the birth place of sorrow, the grave of pleasure, the destroyer of memory, the enemy of the senses." The prince asked, "Will this evil come upon me also?" Then the charioteer said to him:- "Inevitably by force of time, my long-lived lord will know this length of his days. Men are aware that old age thus destroys beauty and yet they seek it." At the age of 29, the bodhisattva realized that, "The heart is in the nature of happiness and what must be extinguished is the fire of lust, hatred and delusion. Only through that can the heart be truly happy. On this very day, I must renounce the household-life, retire from the world, become a monk and seek after the True Happiness." He gave up the luxurious palace life and departed from his wife and other loved ones. One night, when all his attendants were asleep, the Bodhisattva thought that he should leave the palace. Thus, he called to Dunpa, saying: Awaken, and quickly fetch my magical steed Ngakden. I intend to search for the garden of hardships visited by previous Buddhas seeking Enlightenment. I know that this will please all the sages. Dunpa replied: This is not the hour to go to the garden. No one holds malice toward you here; you have no enemies, so why do you need a horse at midnight? The Prince replied: Dunpa, you have never disobeyed me, so do not do so now as we prepare to separate. At last Dunpa brought the horse, but the horse would not allow the Prince to mount him. The Prince told him: Ngakden, this is the last time that you will carry me. So take me without delay to the garden of hardships. After achieving Enlightenment, I will quickly fulfill the needs of all sentient beings through the rain of samadhi. 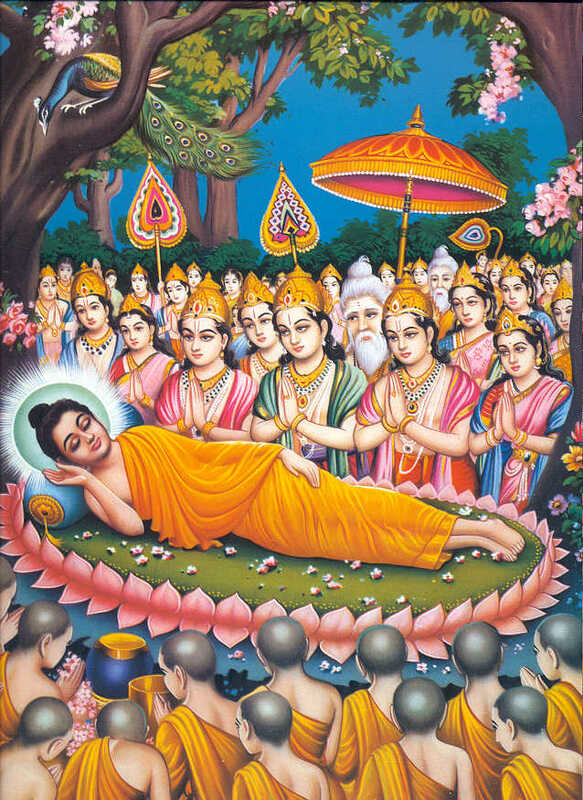 As his father lay sleeping, Bodhisattva circumambulated him and rode off in the night saying: Until I achieve the supreme path of all the Buddhas, I will not return to this city of Kapilavastu. Mounted on his horse and accompanied by his charioteer Dunpa, he passed out of the city gate, an angel opening the gate. Mara, the Evil One offered him Universal Sovereignty if he would abandon his purpose, but the Future Buddha rebuked the temptation and passed on. But the Evil One ever followed him, watching his opportunity. 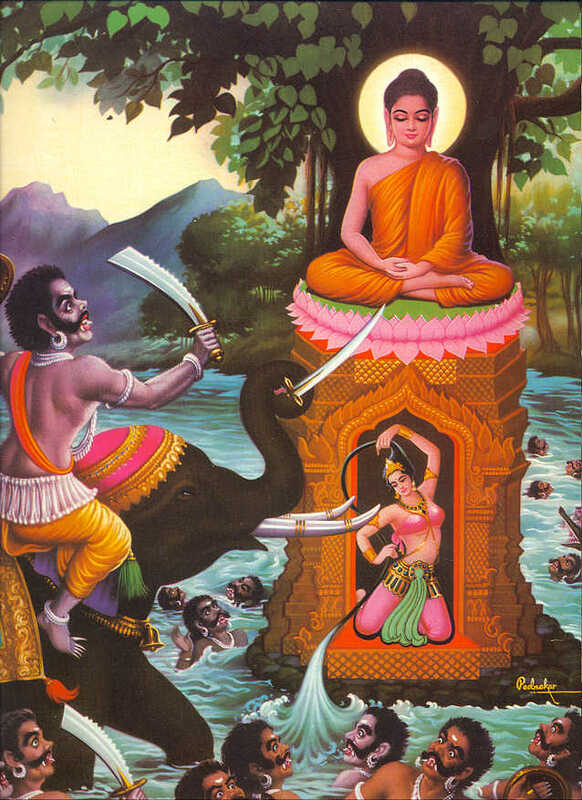 The future Buddha proceeded to the river Anoma, where he received the Eight Requistes of a monk from an angel. Within two sessions (half a day), he discovered a distance which normally takes twelve days. alighting from his horse, he removed his ornaments, gave them to Dunpa and dismissed him and Ngakden. But Dunpa objected: "It is not right that you should remain alone." The Prince replied: All beings come into this world alone; likewise do they die. During this life, they also suffer alone. There are no friends in samsara. He cut his hair in front of the fully pure stupa,and gave it to Dunpa. mountain caves to engage in spiritual practice. After renunciation, the Prince went from place to place and learned from many well-known teachers in his search for the Truth and practice meditation. The prince spent the next seven days in Anupiya Mango Grove in the enjoyment of the bliss of monkhood. He then went on foot to Rajagaha, the capital of King Bimbisara, and made his round for alms from door to door. Bimbisara, pleased with his deportment, offered him his kingdom. But the prince refused his offer, declaring that he had renounced all for the sake of attaining Supreme Enlightenment. 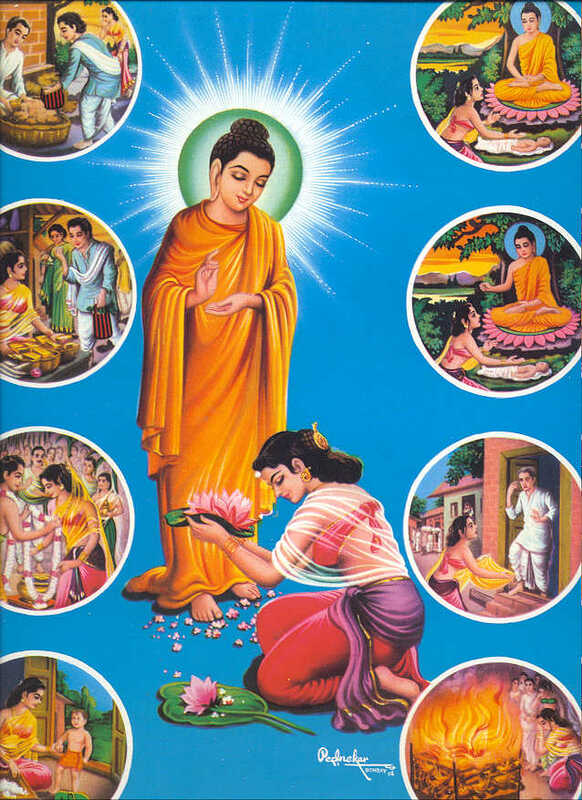 Bimbisara then requested him, as soon as he should become a Buddha, to visit his kingdom first, the future Buddha gave him his promise to do so. 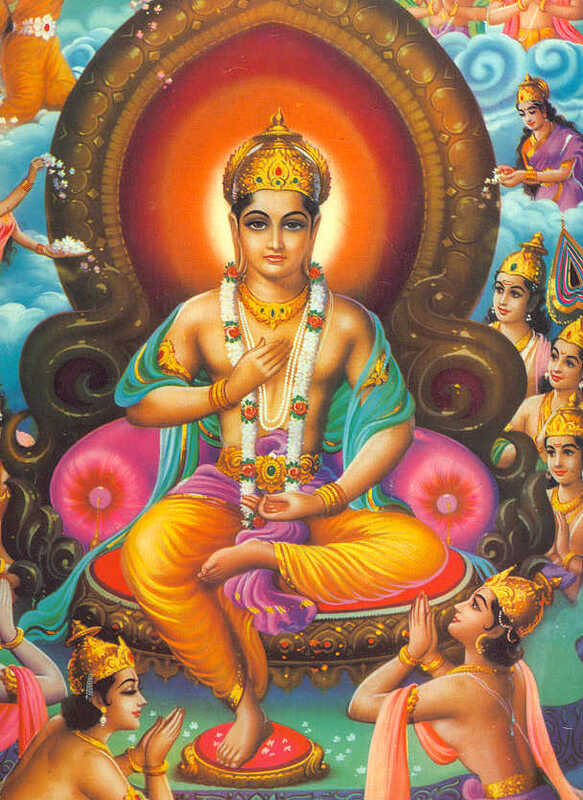 He then attached himself to Alara Kalama and Uddaka Ramaputta, teachers of the Yoga philosophy. But becoming convinced that the Yoga discipline was not the Way of Salvation, he abandoned the practice and proceed to Uruvela, and attended by Kondanna and four other monks, entered upon the Great Struggle. practicing all forms of severe austerity. 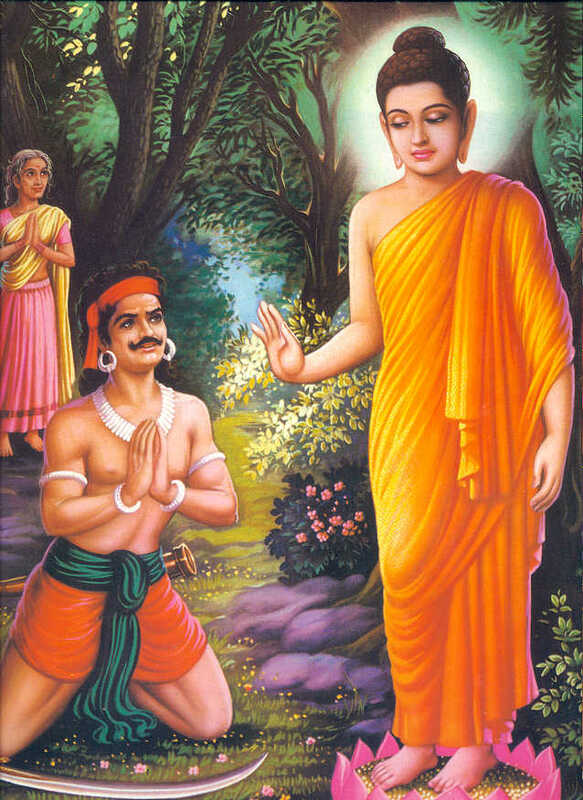 Following the five ascetic rishis, Siddhartha underwent hardships for six years by the banks of the Nairanjana. So great were his austerities that the ribs of his back could be seen. He drank one one drop of water a day. He ate only one grain a day and in this way achieve the highest meditative state. While thus engaged, he was approached and tempted to abandon the Great Struggle by Mara the Evil One, accompanied by his None Hosts, namely, Lust, Discontent, Hunger and Thirst, Craving, Sloth and Laziness, Cowardice, Doubt, Hypocrisy and Stupidity, Gain, Fame, Honor, and Glory Falsely Obtained, Exaltation of Self, and Contempt of Others. But the future Buddha rebuked the Evil One and he departed. One day, while absorbed in trance induced by suspension of the breath, he became utterly exhausted and fell in a swoon. His five companions believed him to be dead, and certain deities went to his father, King Suddhodana, and so informed him. But the king refused to believe this, declaring that his son could not die before attaining Enlightenment. 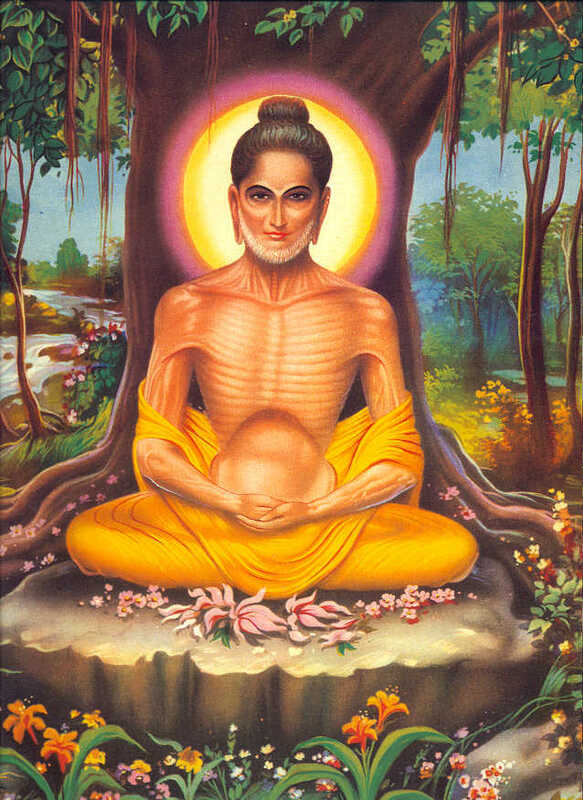 The Future Buddha, convinced that fasting and other forms of self-mortification were not the Way of Salvation, abandoned the Great Struggle. Thereupon his five companions, regarding him as a backslider, deserted him and went to the Deer-park near Benares. milk-rice offered by Gamo and Gatopma. Then he realized that the path of extreme austerities would not enable him to fulfill his vow, so he determined to meditate on building strength of body. Rishi Deva, who had been the Bodhisattva's friend before he renounced the kingdom took pity on his condition and told two village women, Gamo and Gatopma to bring him offerings. When he partook of their milk porridge, the color of his body transformed into pure gold. His five disciples, thinking that he had renounced the path, abandoned him. The Bodhisattva asked the two women how the merit of their offering could be shared, and they replied: Whatever accumulations of merit are created by these gifts. O renowned one, fulfiller of all wishes, we offer to you. May you achieve the ultimate state and fully accomplish your excellent thought. 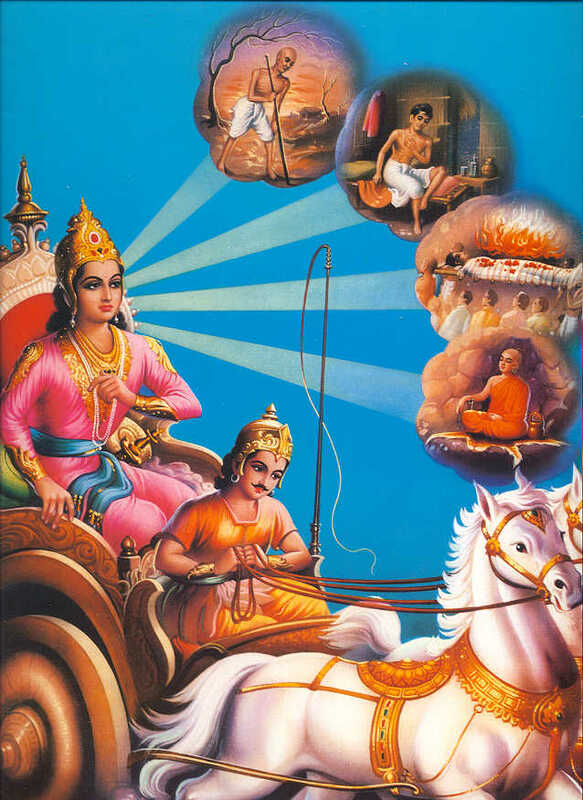 The gods, gazing on him, thought he would soon die, and so they lamented: The son of Shakya, the essence of sentient being, when in the Tushita heaven would have done well to remain and give teachings. But he promised to liberate sentient beings and now it seems he will die. 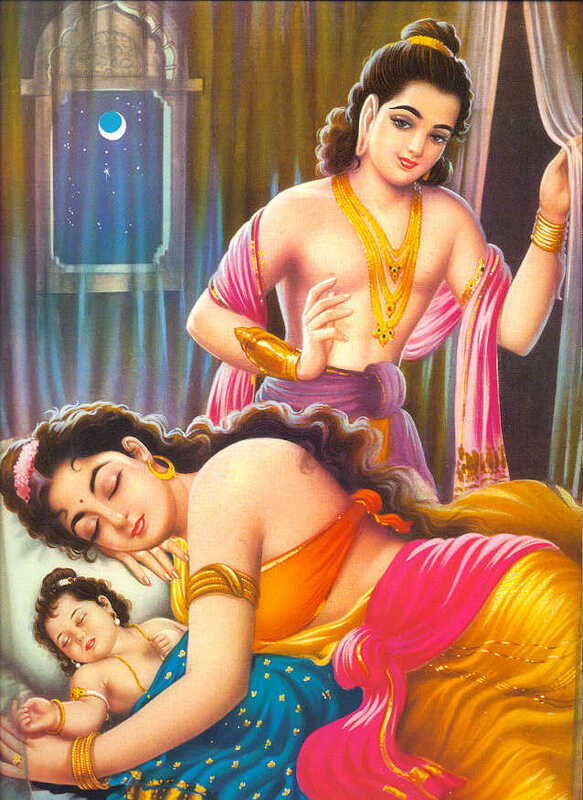 And they told Mahamaya that her son, Siddhartha, would soon pass away. Hearing this, the mother descended form the heavens and made this lamentation: When my son was born in the garden of Lumbini, fearlessly, like a lion, he took seven steps, looked in the four directions and said: This is my final birth. You have not fulfilled this pleasing prophecy; I see the words of the rishi Krishna unrealized that you would achieve Enlightenment. All I see is the impermanence of death. 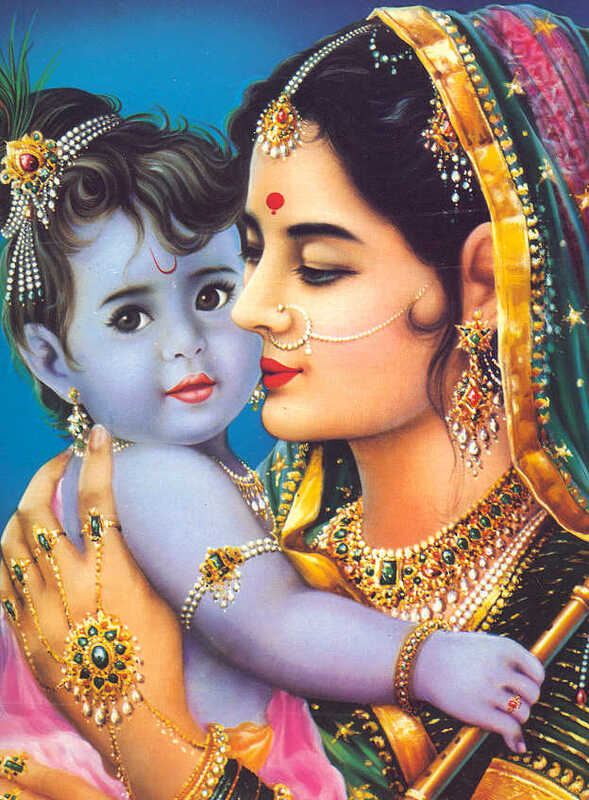 Who will give life to my only son? siddhartha replied: This earth may crumble; the sun, moon and stars fall away. Yet even if I were an ordinary being, I would not die. Soon I will achieve Buddhahood.Despite such allurements and temptation, the prince firmly guarded his senses, and in his perturbation over the inevitability of death, was neither rejoiced nor distressed and thus meditated :- "Do these women then not understand the transitory nature of youth, that they are so inebriated with their own beauty, which old age will destroy? Surely they do not perceive anyone overwhelmed by illness, that they are so full of mirth, so void of fear in a world in which disease is a law of nature. And quite clearly they sport and laugh so much at ease and unperturbed, because they are ignorant of death who carries all away. For what rational being would stand or sit or lie at ease, still less laugh, when he knows of old age, disease and death? It is not that I despise the objects of sense and I know that the world is devoted to them; but my mind does not delight in them, because I hold them to be transitory. I am fearful and exceeding distressed, as I meditate on the terrors of old age, death and disease. I find no peace or contentment, much less pleasure, as I perceive the world blazing as it were with fire. If desire arises in the heart of a man who knows that death is inevitable, I consider that his soul is made of iron, in that instead of weeping he delights in the great danger." Bodhisattva sat, saying: "Even if my flesh and blood dry up and my skin, my nerves and bones disintegrate, yet will I remain in this seat until I achieve Enlightenment which is hard to find even during many kalpas." hatred, etc., fail to disturb the Prince. Mara the Evil One endeavored to drive him from his seat with the Nine Rains, namely, wind, rain, rocks, weapons, blazing coals, hot ashes, sand, mud, and darkness. From his forehead, the Bodhisattva radiated a light known as the Subjugation of the Assembly of Maras. Because of this invocation, all the groups of sinful maras, who delight in negative actions, gathered to his left. The hundred-handed said, "My body has a hundred hands and even one can shoot one hundred arrows. I will therefore pierce the body of practitioners. Father, rejoice, come forth; Do not lag behind." Those who gathered to his right delighted in positive action and were known as Great Discrimination Mind. They praised him, saying: "The body of him who meditates on loving kindness beyond samsara cannot be harmed by poison, weapons and fire. Such weapons, if thrown will be transformed into flowers." It was accomplished as they said. Thus the male maras could create no obstacles neither could the female maras deceive him. In this way, he defeated all the maras. tree by the Neranjara River. After conquering the Mara's host by his steadfastness and tranquility, he, the master of trance, put himself into trance in order to obtain exact knowledge of the ultimate reality. In the first part of the night, he achieved the four stages of samadhi and the state of super-awareness. In the middle watch of the night, he achieved the clairvoyance of recollecting his previous lives; and in the last hours of the night he achieved the stainless wisdom of the end of afflicting emotions. 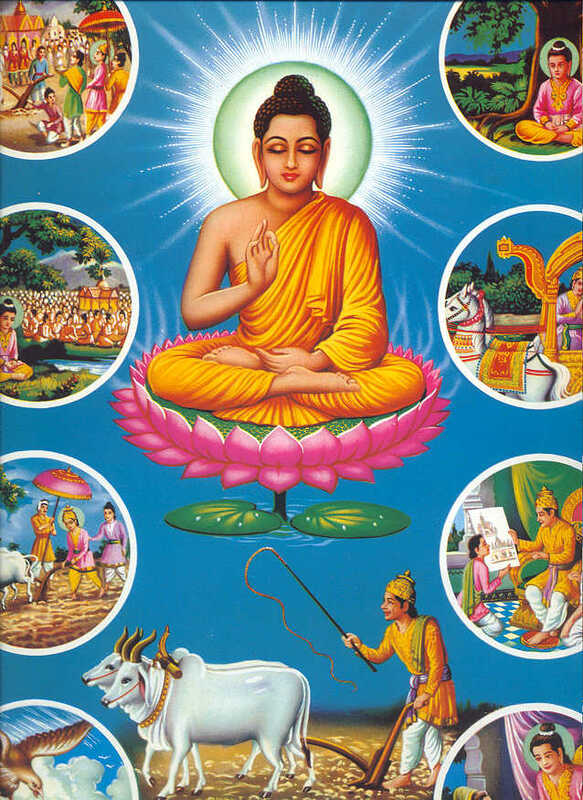 He then realized in a moment the nature of the twelve links of interdependent origination (the twelve nidanas) both in their arising and cessation, as well as the Four Noble Truths. Thus, in a moment, he achieved Enlightenment, the perfect Buddhahood. For seven days, the Buddha sat motionless on the Throne of Enlightenment, experiencing the Bliss of Deliverance. After spending four weeks in earnest thought near the Tree of Wisdom, he spent the fifth week at the Goathered's Banyan-tree. Here he was tempted by the three daughters of Mara the Evil One, namely, Craving, Discontent, and Lust. But he repulsed their advances, saying, "Begone! The exalted One has put away Lust, Ill.will, and Delsuion." 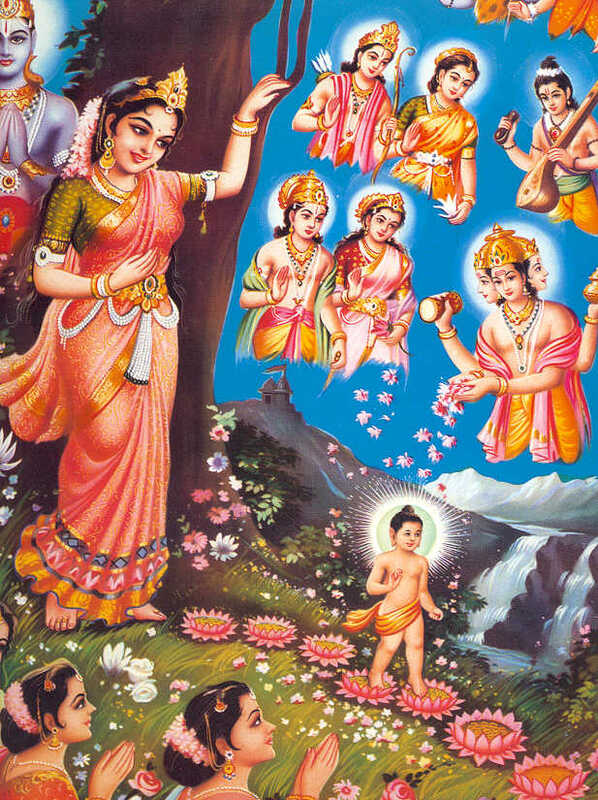 The sixth and seventh weeks were spent at the Mucalinda-tree and the Rajayatana-tree respectively. On the last day of the seventh week, he received his first converts, tow merchants named Tapussa and Bhallika. He then returned to the Goatherd's Banyan-tree. When Buddha attained Enlightenment, he said, "I have found a teaching like ambrosia, profound, peaceful, free from conception, luminous, uncreated. If I tell of this teaching, no one will understand. So I shall stay in the forest without speaking. Bringing offerings, Indra requested the one-thousand-spoked golden wheel with these words. "Like the moon free from eclipse, your mind is completely liberated. Please awaken the victors of battle to kindle the light of wisdom and destroy the darkness of the world." Brahma then appeared and requested: "Go wherever you will, O Sage, but please give the teachings." To them, the Lord Buddha replied: "All beings are chained to desire and remain immersed in that state. Therefore the teachings I have found will be of no benefit even if I offer them." Thus he refused to give the teachings. Again Brahma requested: "The teachings previously given in Magadha are all impure and false. Therefore, Sage, open the door of ambrosia." For many lifetimes, Brahma had cultivated his mind and accumulated great merit so that he could request the teachings from the Buddha. For this reason, the Buddha finally agreed to do as he wished, saying: "The sentient beings of Magadha are full of faith and pure devotion. They are ready to hear the teachings. I will therefore open the door to ambrosia." On the way, Nyendro asked: "Where are you going?" The Buddha said: "I go to Varanasi, to the city of Kashika there I will kindle the teachings in sentient beings who are as blind men. I will beat the drum of the teaching for sentient beings who are as deaf men. I will cause the rain of teachings to fall on sentient beings who are as lame men. As he approached Varanasi, the five disciples paid homage to Buddha. 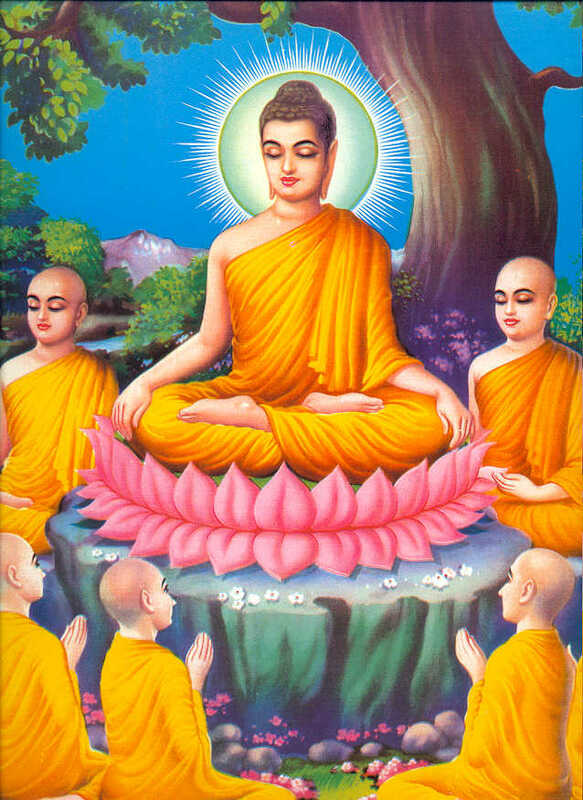 Then Buddha turned the wheel of the Dharma three times in succession. Resplendent with power and glory, Buddha expounded the Four Noble Truths to Kaundinya gotra, Mahanaman, Vaspa, Asvajit and Bhadrajit. "The fool who tortures himself and equally he who is attached to the domains of the senses, both these you should regard as in fault, because they have taken paths, which do not lead to deathlessness. The former, with his mind troubled and overcome by the bodily toils called austerities, becomes unconscious and does not know even the ordinary course of the world, how much less then the supersensual way of truth? Just as in this world one does not pour out water to obtain a light for the destruction of darkness, so bodily torments are not the prerequisite for the destruction of the darkness of ignorance by the fire of knowledge. Just as a man who wants a fire does not obtain it by boring and splitting wood, but does succeed by using the proper means, so deathlessness is obtained by yoga, not by torments. Similarly those who are attached to the lusts have their minds overwhelmed by passion and ignorance, they do not even attain the ability to understand the doctrines, still less then the passionless method of suppression. Just as the individual who is overcome by illness is not cured by eating unwholesome food, so how shall he who is overcome by disease of ignorance and is addicted to the lusts, reach religious peace?" 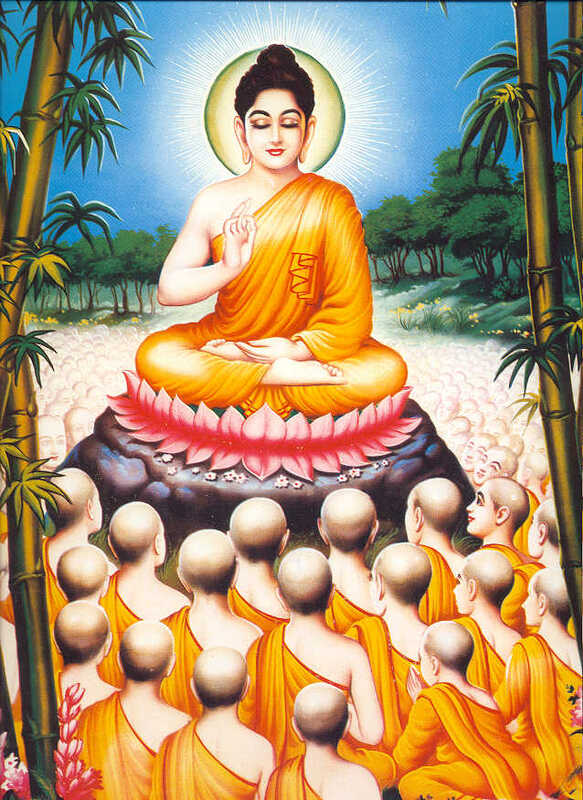 Buddha gave a sermon to 1250 disciples. Just as a fire does not go out, when it has dry grass for fuel and the wind fans it, so the mind does not come to peace, when passion is its companion and the lusts its support. Abandoning either extreme, I have won to another, the Middle Path, which brings surcease from sorrow and passes beyond bliss and ecstasy. The sun of right views illumines it, the chariot of pure right thought fares along it, the rest-houses are right words rightly spoken, and it is gay with a hundred groves of good conduct. It enjoys the great prosperity of noble livelihood and has the army and retinue of right effort; it is guarded on all sides by the fortifications of right awareness and is provided with the bed and seat of concentrated thought. Such in this world is the most excellent eightfold path, by which comes release from death, old age and disease, by passing along it, all is done that has to be done, and there is no further travelling in this world or the next. 'This is nothing but suffering, this is the cause, this is the suppression and this is the path to it: thus for salvation's sake, I developed eyesight for an unprecedented method of the Law, which had been hitherto unheard of. Birth, old age, disease and death, separation from what is desired, union with what is not desired, failure to attain the longed for end, these are the varied sufferings that men undergo. Moggalana, and other chief disciples. In whatever state a man be existing, whether he is subject to the lusts or has conquered self, whether he has or has not a body, whatever quality is lacking to him, know that in short to be suffering. Just as a fire, when its flames die down, does not lose its inborn nature of being hot, however small it be, so the idea of self, subtle though it may become through quietude and the like, has still the nature of suffering. Recognize that, just as the soil, water, seed and the season are the causes of the shoot, so the various sins, passion and the like, as well as the deeds that spring from the sins, are the causes of suffering. The cause for the stream of existence, whether in heaven or below, is the group of sins, passion and the like; and the root of the distinction here and there into base, middling and high, is the deeds. From the destruction of the sins the cause of the cycle of existence ceases to be, and from the destruction of the Act that suffering ceases to be, for, since all things come into being from the existence of something else, with the disappearance of that something else they cease to be. Know suppression to be that in which there is not either birth, or old age, or death or fire or earth or water or space or wind, which is without beginning or end, noble and not to be taken away, blissful and immutable. The path is that which is described as eightfold and outside it there are no means for success. Because they do not see this path, men ever revolve in the various paths. Thus I came to the conclusion in this matter, that suffering is to be recognized, the cause to be abandoned, the suppression to be realized and the path to be cultivated. Thus insight developed in me that this suffering is to be recognized, the cause to be abandoned, the suppression to be realized and the path to be cultivated. Thus sight developed in me that this suffering suppression has been realised, similarly that this path has been cultivated. When Buddha, full of compassion, thus preached the Law there in these words, he of the Kaundinya clan and a hundred deities obtained the insight that is pure and free from passion. Buddha spoke, "I know, O king, that in your compassionate nature you are overtaken by sorrow at the sight of Me. Give up that delight in having a son, and becoming calm, accept from Me the Law in place of a son. What no son has ever before given to a father, what no father has ever before received from a son, that which is better than a kingdom or than paradise, know that, O king to be the most excellent deathlessness. Guardian of the earth, recognize that nature of the act, the birthplace of the act, the vehicle of the act and the lot that comes by maturation of the act, and know the world to be under the dominion of the act, therefore practize that act which is advantageous. Consider and ponder on the real truth of the world. The good act is man's friend, the bad one the reverse. You must abandon everything and go forth alone, without support, accompanied only by your acts. The world of the living fares on under the impulse of the act, whether in heaven or hell, among animals or in the world of men. The cause of existence is threefold, threefold the birthplace and various are the deeds that men commit. Therefore rightly direct yourself to the other alternative and purify the actions of your body and voice. Strive for quietude of the mind. This is your goal; Knowing the world to be restless as the waves of the sea and meditating on it, you should take no joy in the spheres of existence, and should practise that act which is virtuous and leads to the highest good, in order to destroy the power of the act. Know that the world ever revolves like the circle of the asterisms; even gods pass their peak and fall from heaven, how much less then may one rely on the human state? Look therefore on the world as encompassed with great dangers like a house on fire, and seek for that stage which is tranquil and certain, and in which there is neither birth nor death, neither toil nor suffering. Crush the hostile armies of the faults, for which there is no need of wealth or territory or weapons or horses or elephants. Once they are conquered, there is nothing more to conquer. comprehend suffering, the cause of suffering, the appeasement and the means of appeasement. By thoroughly penetrating these four, the great danger and the evil births are suppressed." who murdered others for their fingers. Enlightened leading a life of happiness and serenity. elephants released by King Ajatasatti. The street of Rajagrha became impassable through the corpses, which the elephant had struck with his body or taken up with his trunk or whose entrails were drawn out by his tusks and scattered in heaps. 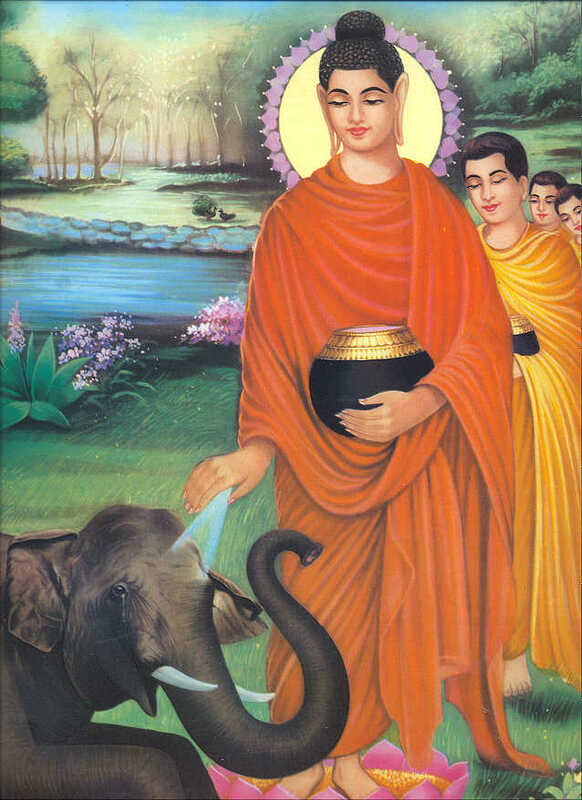 Buddha said, " The slaughter of the Sinless one is accompanied by suffering; Do no harm, O elephant, to the Sinless One. For, O elephant, the life of him who slays the Sinless does not develop from existence to existence in the eight good births. The three, love, hatred and delusion, are intoxicants hard to conquer; yet the sages are free of the three intoxicants. Free yourself therefore of these fevers and pass beyond sorrow. Therefore in order to abandon this love of darkness, be quit of intoxication and resume your natural self. do not, O lord of elephants, slip back through excess of passion into the mud of the ocean of transmigration." The elephant, hearing these words, was freed from intoxication and returned to right feeling; and he obtained the good internal pleasure, like one released from illness on drinking the elixir. Lord Buddha went to Kusinagara near the Hiranyavati River. He blessed all the sentient beings, each in their own language, as he thought of them all as his own sons, saying that if any doubts or hesitations were arising, they should question him during these, his last moments. Those gods, demi-gods and humans who loved the Dharma gathered the finest offerings and supplicated him with these words: "All the sentient beings, tortured by the disease of afflicting emotions, are separated from the skillful physician of the Dharma. 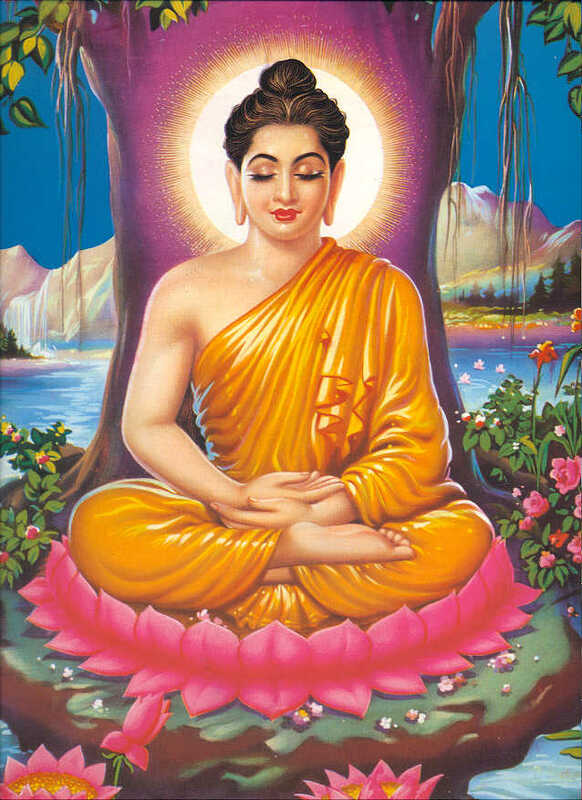 Lord Buddha, the blessed one, do not abandon us." 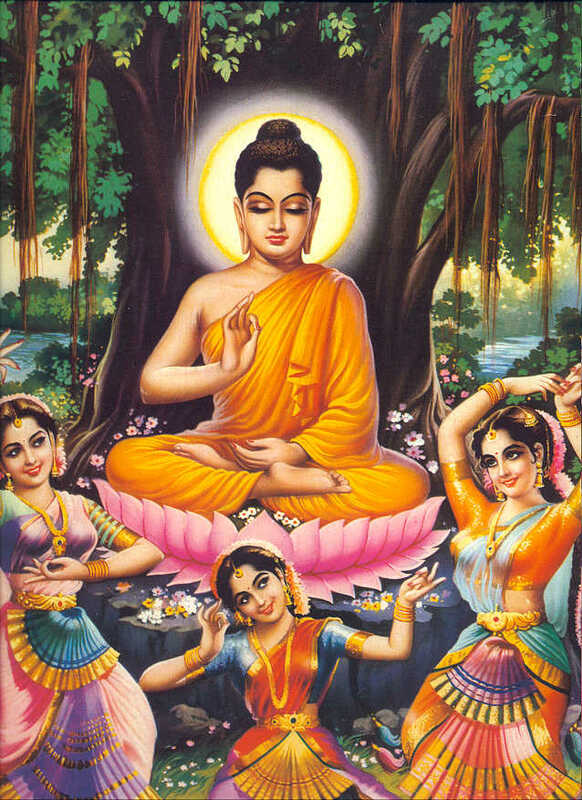 The Buddha replied: "The Buddhas are Dharmata therefore they remain. Dedicate your lives to awareness and protect your thoughts through mindfulness. Renounce all non-virtuous actions. Be content and happy." Buddha died in 483 B.C.. The Buddha pointed out that life is suffering and that suffering is caused by ignorance and desire. 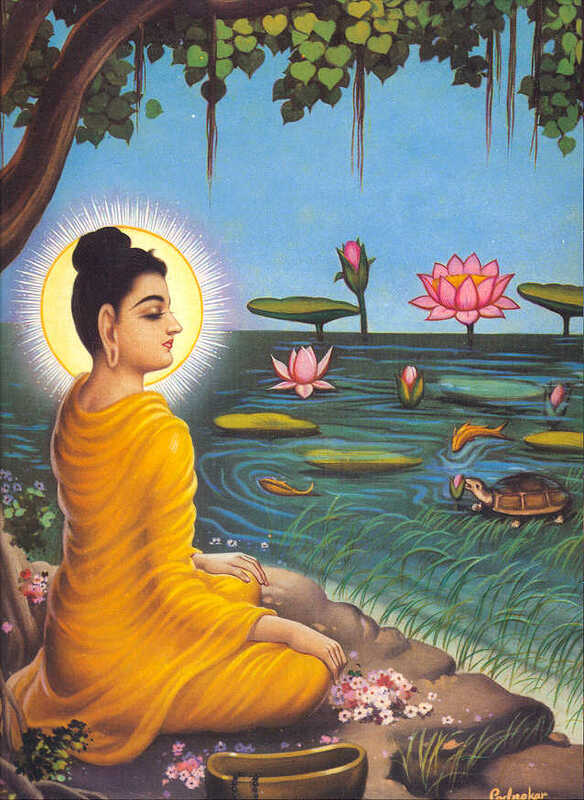 In order to end suffering, one has to follow the path shown by the Buddha, it is the Noble Eightfold Path. It means right understanding - understanding the law of cause and effect; right thought - pure and kind thoughts; right speech - truthful and gentle speech; right action - good and law-abiding conduct; right livelihood - proper and purposeful occupation; right effort - striving to improve and progress; right mindfulness - mindful of thought and conduct; right meditation - practicing meditation to gain wisdom. He said, "We must guard against the three fires of greed, hatred and ignorance, as they keep burning in our minds causing sufferings. To put out the fire of greed, one must avoid the extremes of sensual indulgence and self-torture. To put out the fire of hatred, one must practice compassion. To put out the fire of ignorance, one must understand the Four Noble Truths and practice the Noble Eightfold Path." He emphasized compassion in his teaching. He told us to be concerned for each other, to help each other. 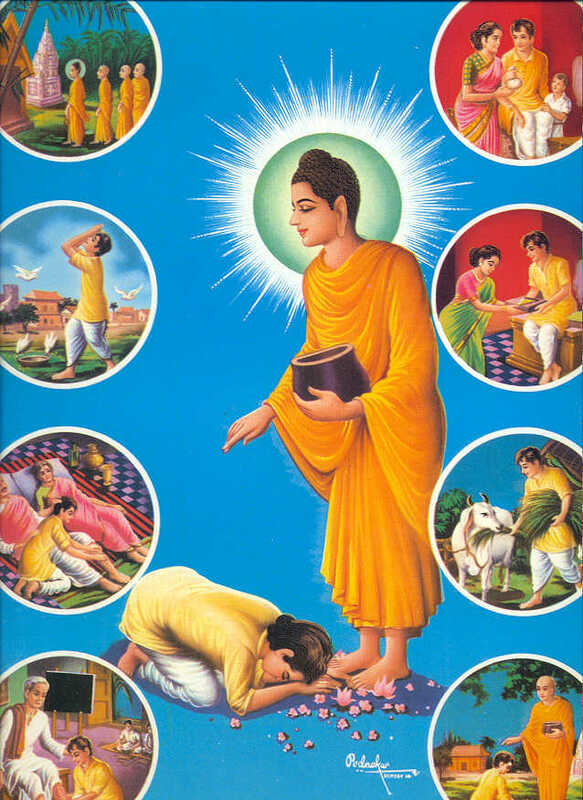 He emphasized the equality to all beings and stressed on self-reliance. 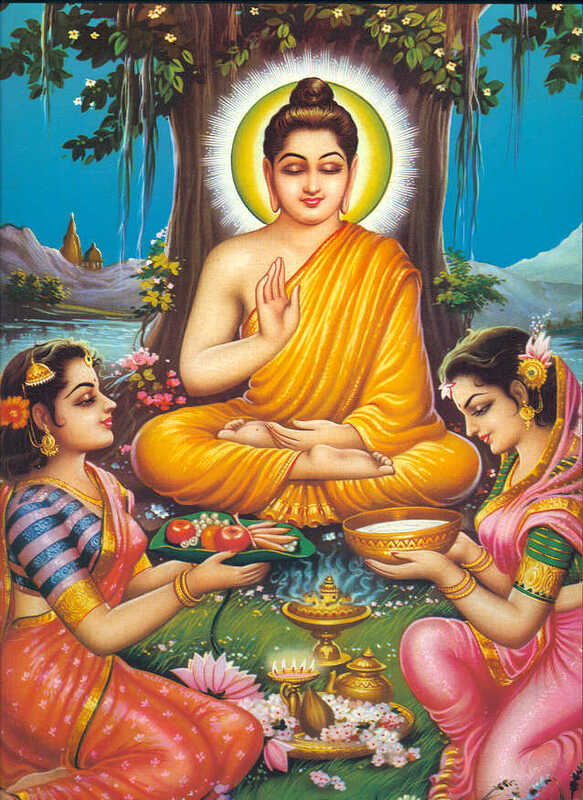 He said that everyone has the Buddha nature and everyone can become a Buddha provided he himself practices diligently. The Buddha said that everyone is responsible for his own actions. Virtuous action creates good karma and non-virtuous action brings bad karma. One can be reborn in any of the six realms. The six realms are the god realm, the demi-god realm, the human realm, the animal realm, the hungry ghost realm and the hell realm. The karma of one's past determines which of the six realms he will be reborn in. 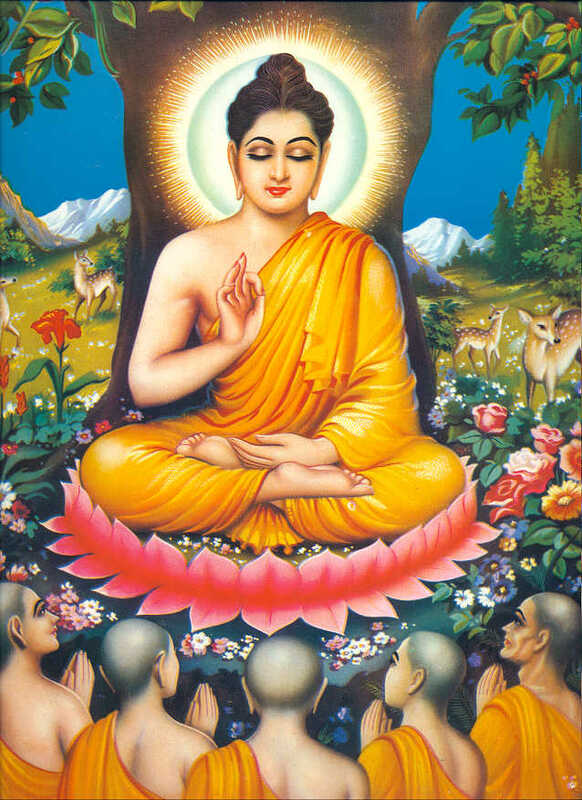 He showed us the Noble Eightfold Path, by practicing which we can be freed the cycle of birth and death, and attain the supreme happiness of Nirvana. all be free from obstruction. on the techniques of the teaching, and on the nobility and importance of the community. May we not be separated from vision of the Buddha. May our minds become pure and attain the qualities of Buddhahood. give up doubts about the truth and live according to the supreme Dharma teaching.